Several weeks ago, I had the pleasure of meeting Jack Bishop in person when he visited San Francisco. Jack is the cohost of my one of my all time favorite TV shows, the Cook's Illustrated America's Test Kitchen . It's one of the few shows that successfully brings food and science together and for a geek like me, that is simply amazing! 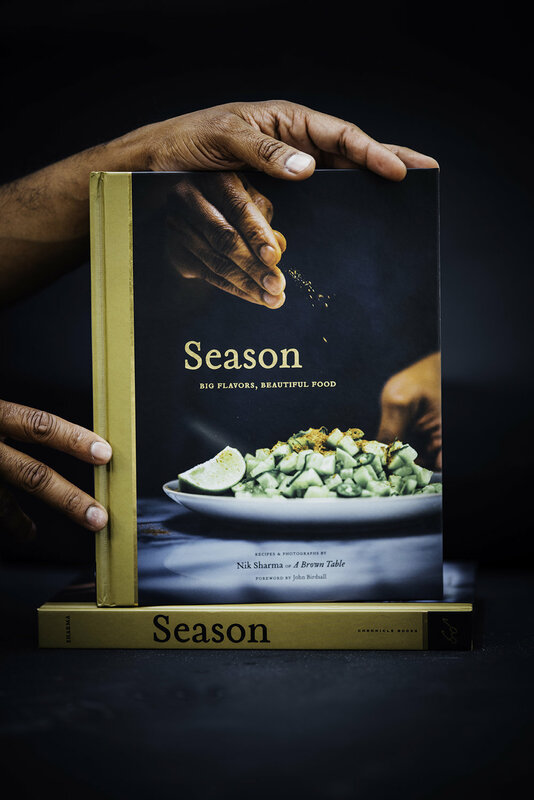 How long to cook, how to brine, how sugar affects texture and flavor, etc. So many questions that we all think about and want to test to answer. To a food scientist, it's a dream come true! Jack was fun to talk with and he shared a lot of fun stories about the show and the happenings in their test kitchen. I own most of the books from America's Test Kitchen and since I love to bake their Baking Book) is one of my favorite resources to learn from. 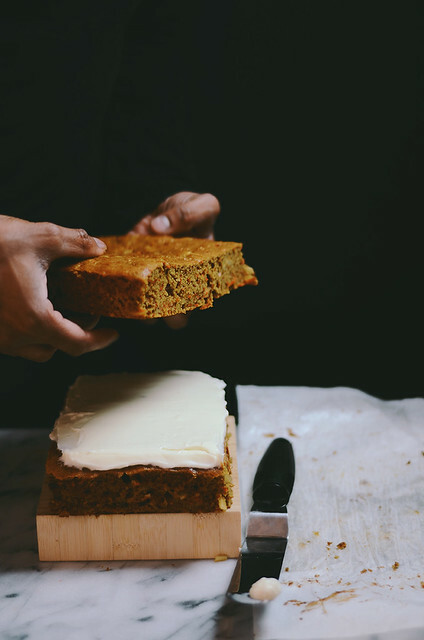 America's Test Kitchen was super kind in letting me share this recipe from their book, this carrot cake is a favorite in our home and I'm always tweaking the recipe to play with the flavors. Carrot cakes are perhaps one of my favorite "vegetable-type" cakes to make at home, they are simple to make and rather rustic yet absolutely delicious. 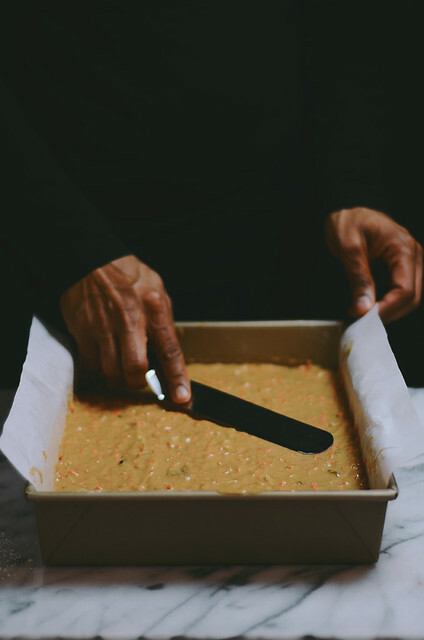 A while back, I made this apple cake flavored with masala chai and today, I'm infusing this carrot cake with chai (Hindi word for tea is chai) and using a few of my favorite spices that I add to chai when I have a craving for masala chai (Hindi word for spices is masala). I've skipped the vanilla flavor in the cream cheese frosting in favor of pistachio. The cream cheese frosting is not cloyingly sweet and balances the flavors of the cake with its tanginess. I made a layer cake out of the single pan I baked but you don't need to do that, you can simply frost the cake without slicing it in half and serve. You can also double the quantities in the recipes for the cake and the cream cheese frosting and make two large cakes and layer them. 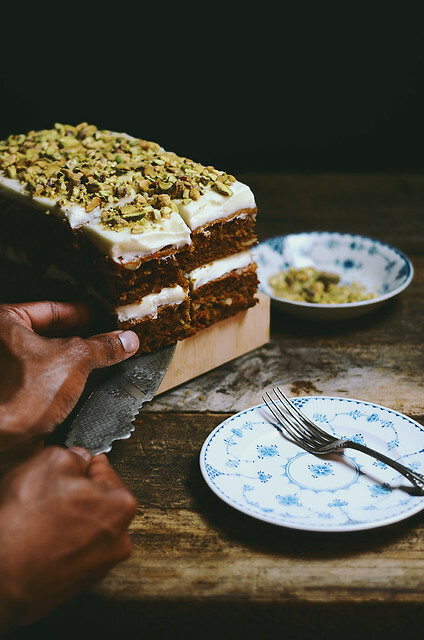 You can add other spices to this cake but I personally prefer just cardamom and ginger in my masala chai (tea) when I make it at home. I've added a little cinnamon because it brightens the flavors of the carrots well. You can flavor the cream cheese frosting with plenty of other flavors such as vanilla. But chai and pistachios make a good match so I didn't mess with this pairing. Use an offset spatula with a smooth edge to get clean finish when frosting. As always with any cake that is frosted place the cake on a cake board to give it support and for easy transport. 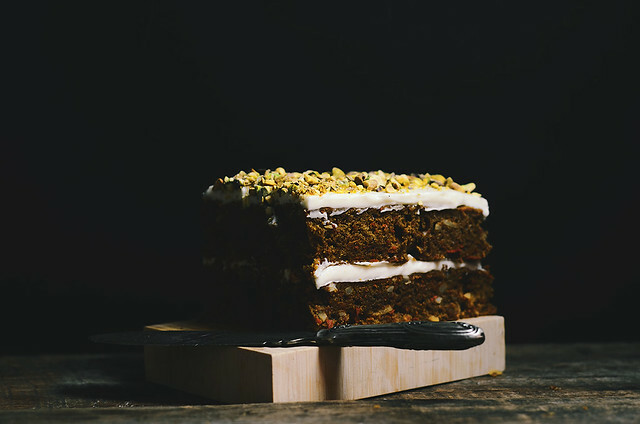 Carrot cakes are generally weaker and much more delicate so I recommend playing safe and using a cake board to prevent the cake from breaking. 1. Pour the boiling water over the tea leaves and let this sit aside for 10 minutes. Strain the tea leaves and reserve the tea concentrate until ready to use. 2. Place a rack in the middle position and preheat the oven to 350F. Grease a 13X9 inch baking pan and line with parchment paper. Grease the parchment paper and lightly dust the pan with a little flour. Keep the prepared pan aside until ready to use. 3. Dry whisk the flour, baking powder, baking soda, cinnamon, green cardamom, ginger and salt together in a large bowl and set aside. 4. Using a food processor fitted with the large shredding disk, shred the carrots. Transfer the carrots to large mixing bowl. Wipe the bowl food processor clean and then attach the metal blade. 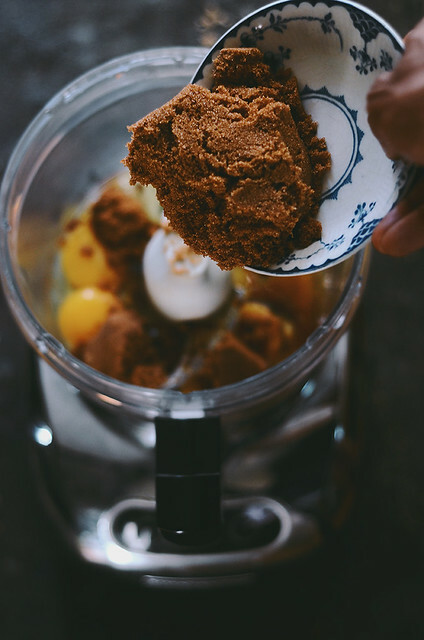 Place the granulated sugar, brown sugar, eggs and reserved tea in the food processor and pulse for about 30 seconds until combined. Now, run the food processor and slowly pour the oil in a steady stream until the mixture is completely emulsified. This should take about 20-30 seconds. 5. 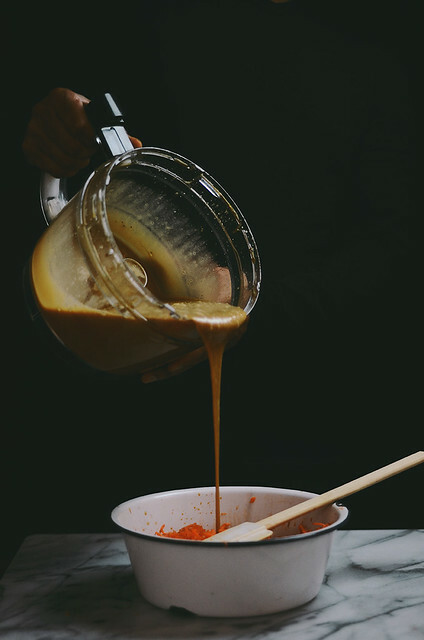 Pour the emulsified mixture over the shredded carrots and fold with a silicone spatula. Now fold in the flour until no visible specks of flour can be seen. Quickly fold in the raisins with the silicone spatula. Transfer the batter to the prepared cake pan and bake the cake for about 35 to 40 minutes, rotating halfway through the baking process. The cake will be golden brown when done and a skewer/toothpick/knife will come out clean when inserted into the center of the cake. Remove the cake from the oven and allow to cool completely in the pan, this should take about 2 to 3 hours. Run a knife around the edges of the cake to release. 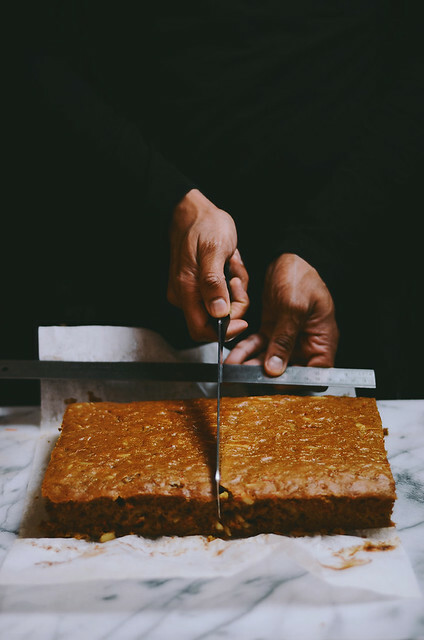 Trim the edges of the cake with a sharp serrated knife and then cut the cake in half along it's length to get two 6.5 X 9 inch rectangles. Wrap the cakes separately with cling film and then chill the cakes for at least 2 hours before frosting. 6. Layerthe top surface of one cut cake with half of the cream cheese frosting using an offset spatula. Place the second cake over it and layer with remaining cream cheese frosting. Garnish with pistachios. Serve immediately. 1. Place the cream cheese, butter, sour cream, pistachio extract and salt in the bowl of a stand mixer. Using the paddle attachment beat the ingredients on low speed and then gradually increase to medium-high speed until combined. You will need to scrape the sides of the bowl down occasionally to bring the ingredients together. 2. Stop the mixer and add in the sugar. Beat the mixture on medium-low speed until the sugar completely disappears and then increase to medium-high speed. You will need to scrape the sides of the bowl down occasionally to bring the ingredients together. Transfer the frosting to an airtight container and keep chilled until ready to use. NOTE: I've had a question about the baking pan in the photograph shown above. The pan is 13X9X2 inches and is not a square pan.